*Requires eligible trade-in. Terms and conditions apply. Who is eligible to participate in the Samsung Galaxy Upgrade Offer? Any US/DC/PR/USVI resident who is at least 18 years of age who purchased a new Samsung Galaxy Note9, S9+, or S9 from a participating carrier or retailer between 10/5/2018 and 11/3/2018. No other Samsung devices are eligible for this promotion. For additional details, see Terms and Conditions at the bottom of the page. I bought a different Samsung device. Am I eligible for this offer? No, only the purchase of a Samsung Galaxy Note9, S9+, or S9 qualifies. What will I receive when I trade-in my eligible device after my new Samsung device purchase? You will get double your trade-in value, up to $600. This value will depend on the device model and condition. If your device is not eligible for the anticipated trade-in value, you will receive $50. Terms and Conditions apply. How long will it take for me to receive my reward after my trade-in device evaluation is complete? After your evaluation is completed, your Visa® Virtual Reward will be sent to the email address you registered within approximately 3 weeks. Can I also register my purchase for another Samsung offer? This offer cannot be combined with other carrier, retailer, and Samsung Trade-in offers. How do I participate in this trade-in using the Shop Samsung app? Download and install the Shop Samsung app on your Samsung Galaxy Note9, S9+, or S9 in the Google Play store. Open the Shop Samsung app, tap the “Menu Icon” on top left > select “My Inbox” > Galaxy Upgrade offer. Tap DO I QUALIFY? to get started. Tap REGISTER NOW for the Samsung Galaxy Upgrade Offer. Upload receipt/proof of purchase and agree to Offer and Trade-In terms. Submit registration form by 11:59:59 PM ET on November 17, 2018. A registration confirmation will appear in the app and within 7 days, a printable trade-in shipping label with instructions to send your trade-in back to Samsung will appear in a browser to be printed immediately or downloaded to your device to print later. Use the provided shipping label to send back your device; do not have your own label created. Follow the instructions to send your trade-in device back using only the provided shipping label and box you received with your new device. Once your trade-in device evaluation is complete, this could take up to 30 days, you will receive a Visa® Virtual Reward within 3 weeks with your specified value via email or through the Shop Samsung App. How do I register if I purchased more than 5 phones? If you purchased multiple devices, you will need to register each device individually through the Shop Samsung app. After registering the first device, tap REGISTER ANOTHER DEVICE to continue registering your next device. If I registered to trade-in more than one qualifying device, where can I find the trade-in status and shipping label for my other devices? The trade-in status and shipping label for the first device you registered can be found in Menu > My Inbox. Your trade-in status and shipping label for each additional registered device will be sent to the email address you registered with. Please ensure that the correct shipping label is applied to each trade-in device prior to shipping. The Shop Samsung app asks me for permission to make and manage phone calls. Why does Shop Samsung need access to this information? Shop Samsung requires this Android permission to check your device IMEI for eligibility. Shop Samsung will not access your contacts or address book. The Shop Samsung app asks me for permission to access my contacts when I tap the Register Now button on the promotion. Why does Shop Samsung need access to this information? Shop Samsung requires this Android permission to access your Samsung Account to log you in automatically. Shop Samsung will not access your contacts or address book. Can someone else register my offer claim on my behalf? No, you must register your own offer claim. Rules specify that you may not have a third-party representative register on your behalf. What kind of proof of purchase will I need to provide to redeem this offer? In-Store Purchase: Save your receipt/proof of purchase. Online/Phone Purchase: If you purchased online or over phone, please save your email confirmation. If you do not have any proof of purchase, you will need to return to the carrier/seller store and request a receipt/proof of purchase listing your eligible device and a purchase date between 10/5/2018 and 11/3/2018. 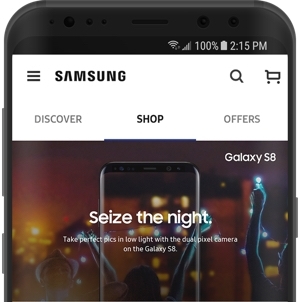 What happens if I purchased my Samsung device on Samsung.com or the Shop Samsung app? If you purchased your device on Samsung.com or the Shop Samsung app, you will go through the trade-in evaluation as part of the check-out process. Based on your evaluation estimate, you will receive an instant trade-in credit for trading in your current smartphone. Can I register to trade-in more than one qualifying device? Yes. Use the Shop Samsung App to register your first device and then tap REGISTER ANOTHER DEVICE on the Thank You confirmation page. Can I register a claim on each qualifying device using the same Samsung Account? Yes, you are able to use the same Samsung Account to register a claim on each qualifying device. What information do I need when registering my claim? You must have your receipt/proof of purchase(s) in hand to fully complete the registration process. If I lost my receipt/proof of purchase to the qualifying device purchase, can I still participate in this offer? You will need to provide proof of purchase. If you do not have a receipt/proof of purchase, please see your retailer and request a new proof which can include, but is not limited to, a purchase confirmation email, receipt or packing slip, listing your eligible device and a purchase date between 10/5/2018 and 11/3/2018. When is the latest I can enter my information in the Shop Samsung app to take advantage of this offer? You will not be able to register for this offer after 11:59:59 PM ET on November 17, 2018, and will no longer be eligible for the offer after that time. What happens if I am having general problems with my claim registration? To receive help with your registration, you can engage in a Chat conversation by tapping the chat icon at the top right of your screen or you can contact Samsung Customer Support at 1-866-888-5503 for further assistance. What do I do if I registered my information, but I have not received an email or app confirmation within 24 hours? From the app, you can check your registration status from Menu > My Inbox or online here. Check your Spam folder (emails will be sent by noreply@samsungpromotions.com or noreply2@samsungpromotions.com). If there hasn’t been an update to your registration status within 48 hours, please contact Customer Support at 1-866-888-5503. What do I do if I am rejected? You will receive an email explaining why your claim registration was rejected along with the steps to resubmit. You cannot resubmit an offer claim form more than one (1) time. Resubmissions must be completed by November 24, 2018. If you do not receive this email, please contact Customer Support at 1-866-888-5503. What can I do if I receive a networking error when uploading my receipt in the Shop Samsung app? Please note the maximum file size allowed is 12MB. Please check your file size and try uploading your receipt again. Where should I go if I need to resubmit my claim? If your claim has been rejected, you can resubmit your claim with receipt/proof of purchase from the link sent in the email you have received. You can check your registration status in the app from Menu > My Inbox or online here. What should I do if I’m taking a picture of my receipt but the picture comes out blurry? Please try to take the picture in good lighting and ensure receipt/confirmation date and qualifying device name are clearly readable. Please note the maximum file size allowed is 12MB. How long will it be before I can see a status update after submitting a claim? Please allow at least 24 hours after submitting, using the email address you registered with for the offer, for your registration status to become available. How do I ship my trade-in device to Samsung? Once your registration has been approved, you will receive a printable trade-in shipping label within 7 days. Use this label and the box your new phone came in to send your trade-in device back for evaluation. Your device must be labeled with an FCC ID to show that it is certified for use in the United States under applicable FCC regulations. The FCC ID number can usually be found printed somewhere on the mobile device. Sometimes it may be necessary to remove the battery pack to find the number. The FCC ID number can also be found in the user manual for each device. Check https://www.samsung.com/us/trade-in/ for smartphone models that currently qualify for trade-in. The types of devices eligible for trade-in may be updated at any time by Samsung. In the case of updates, the drop-down menus where you select your trade-in device at the time of your purchase of your new device will reflect any changes. Why am I not getting exactly "double" the everyday trade-in value? The trade-in values for the “double your trade in” promotion are not an exact doubling of the everyday trade-in prices, and will vary depending on trade-in device make and model. Please see the above grid for the current pricing. No — leased devices are not eligible for this Trade-In Promotion unless you purchase the leased device from your carrier before trading it in. Check with your carrier for details. When I ship back to Samsung the device I’m trading in, should I send the charger, case, or other accessories with the device? No — you should only ship the device back to Samsung, and if you no longer need them, discard the other accessories in accordance with your local trash and recycling regulations. No trade-in value is offered on anything other than the device, and if you do ship accessories back with the device, those accessories will not be returned. Can I trade-in more than one device with the shipping label that was sent to me for my trade-in? No — you should only ship one device per trade-in label for each trade-in order. No trade-in value is offered on anything other than the one trade-in device for your order. Refer to the user manual or support page on Samsung’s website for how to do a factory reset on your current device, prior to shipping it back to Samsung. In addition, make sure that you remove all passwords, locks, SIM cards, and memory cards before sending the device to Samsung. If these items are sent with your device, they will not be returned. Please note that Samsung assumes no responsibility for any personal information you leave on your device when you ship it back to Samsung as a trade-in. You will receive updates in the Shop Samsung app when your device has been received and evaluated; as long as the device meets the criteria described above, you don’t need to do anything else. What if I lost or threw out the shipping label that was sent to me for my trade-in? If you have lost or discarded the shipping label, please refer back to your original email with the shipping label or you can go into the Shop Samsung app > My Inbox to reprint or redownload the label. What other resources are available if I have questions that are not answered by this document? You can get additional help by calling Samsung Customer Support at: 1-866-888-5503. * Requires eligible trade-in. 18+ 50 US/DC/PR/USVI requires qualifying purchase of Galaxy Note9, S9+ or S9 from a participating carrier or retailer by 11/3/2018 but only valid while supplies last. Using Qualifying Purchase device, follow the instructions on Shop Samsung app to submit required info and send in your eligible trade in device by 11/17/2018. If Samsung determines your trade-in device meets all eligibility requirements, you will receive your Visa® Virtual Account by email in apprx 8-12 weeks. To be eligible for trade-in, your qualifying device must meet all Trade-In Program eligibility requirements, which include, but are not limited to, that the device powers on, holds a charge, and does not power off unexpectedly; has a functioning display; has no breaks or cracks in the screen (unless a cracked screen offer applies); has no breaks or cracks in the case; has no liquid damage (whether visible or not); has no other defects that go beyond normal wear and tear; is not on a black list; has a verified FCC ID; has been reset to factory settings; has all personal information removed; has all software locks disabled; and is owned by you (leased devices are not eligible). If you send in your trade-in device but Samsung determines your device does not meet all eligibility requirements, you will only receive a Visa® Virtual Account for $50. Under no circumstances will Samsung be able to return your trade-in device if it is not eligible for trade-in. You may not participate in this Offer if you lease or otherwise do not own the device you would be trading in. Participation in this program does not excuse you from contracts with your carrier or retailer (or any related payments or fees) for the device that was traded in. Limit 1 trade-in per Qualifying Purchase. The Trade-In Program cannot be combined with any other Samsung, carrier or retailer promotions, discounts, or offers unless specifically provided for in the terms and conditions of such offers. Additional terms, including terms that govern the resolution of disputes, apply. Offer is not valid with other carrier/retail trade-in offers. BOGO purchases only eligible for first Qualifying Purchase. See www.samsung.com/us/trade-in/terms-and-conditions/ for eligibility requirements & promos.samsung.com/terms for terms/conditions for this special promotion. © 2019 Samsung Electronics America, Inc. Samsung, Galaxy Note, Galaxy S and Shop Samsung are all trademarks of Samsung Electronics Co., Ltd. All other brand, product, and service names and logos are marks of their respective owners. Screen images simulated. Appearance of products may vary.